I mentioned in my last post that we got Kate a water table! We've had a busy week filled with doctor's appointments (all for me/ Will) but we finally had some time to pull it out and splash in the water yesterday! 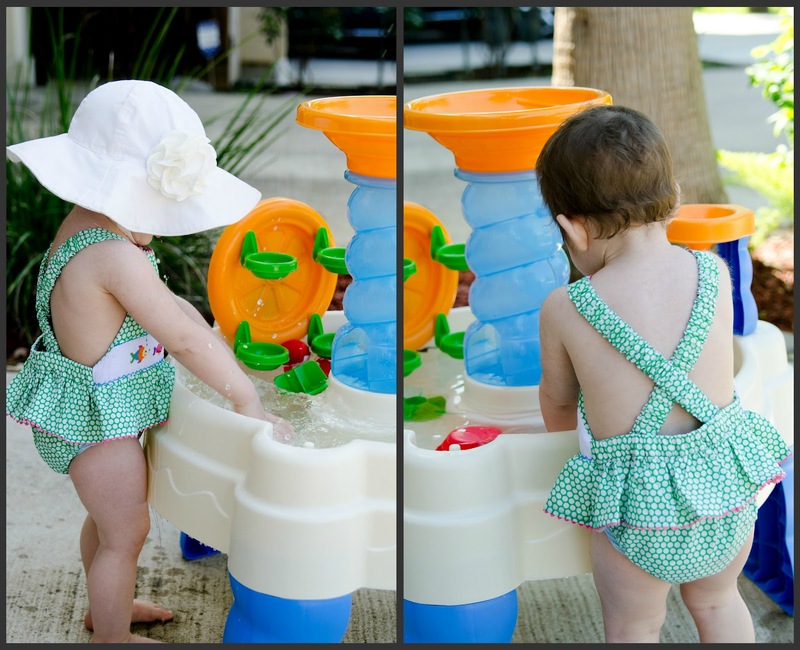 Of course we had to pull out our new smocked bathing suit! 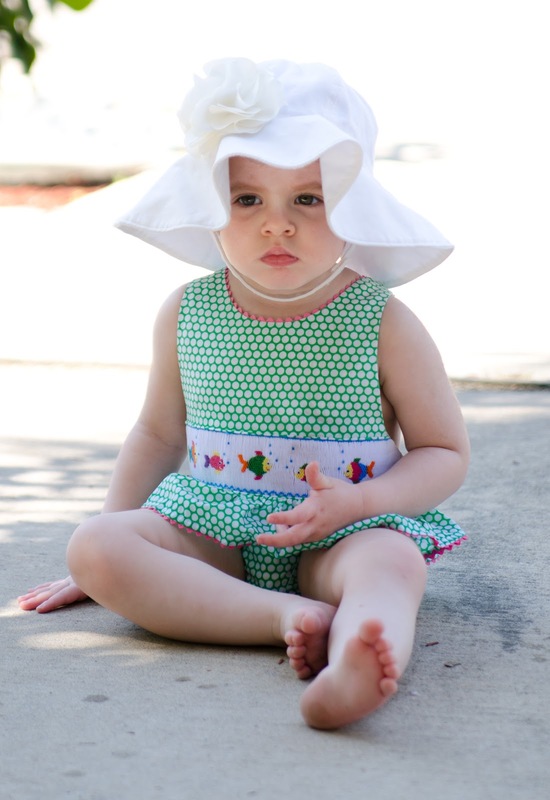 I am in love with this suit of Kate's and am considering getting her another smocked one! I ordered it from SheShe Made and I'm pretty sure she still has some available (link)! Kate enjoyed splashing around in the water and it was nice to have her contained and occupied without having to chase her up and down the sidewalk! I am just too slow/ tired these days to chase a very fast 19 month old! Apparently the rocks in our front area needed a bath? Kate collected about 4-5 and washed them all while playing! Taking a break and sitting in momma's chair! I just love this sweet girl to pieces! I can't believe I have less than a week before she is no longer my only sweet baby. It's definitely bitter sweet to think about having to share my time. I've given so much to Kate since the day she was born and thinking about adding another baby to the mix brings about so many mixed emotions. 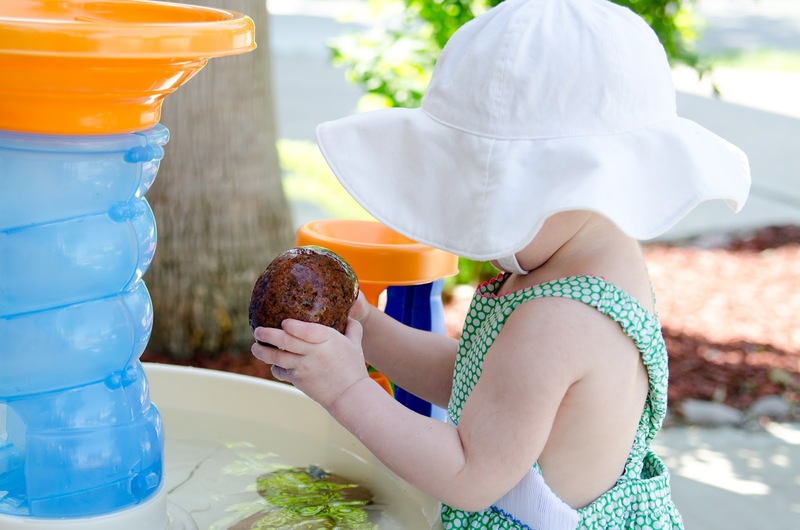 Someone asked about the water table when I mentioned it yesterday - it is the Little Tikes Spiralin Seas table. I've posted a link to Amazon but, I got it at Toy R Us earlier this week on sale for $30. I'm not sure when the sale ends but, TRU definitely has the better price if it is still on sale! I'm sure we will spend many days splashing in the driveway this summer! AB has a water table too & loves it!! Gorgeous suit, we might have to get one too! Less than a week until Will...? Where did the time go? Too too cute! Love her suit! I got KP that same water table but of course the week we got it it was 80 and ever since it's only been a high of 60, so we haven't used it yet! So fun! 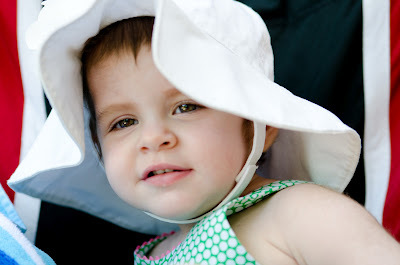 She looks too cute in her hat! Only 1 week until Will - that is so exciting! I think Mia needs one of these. She'd love it! She keeps getting more and more beautiful by the day!!! Your feelings are so normal, I was a mess before Sierra was born, but you naturally adapt, I promise. It's a huge adjustment, but it just seems to somehow work out! You will be in your glory with your two sweet babes!!! We have that exact same water table! We got it for Lila right after Alli was born for the same reason! 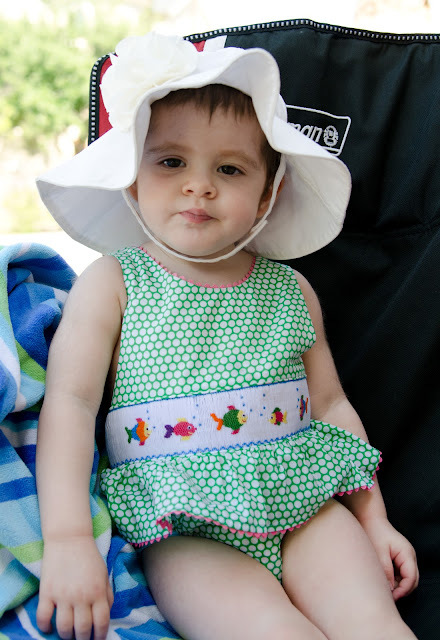 I loved giving her some water to play in that didn't require me chasing her around in the pool with a newborn! Enjoy these last few days!! So cute! And she is rocking that suit!! I'm so going to find a water table tomorrow! I have the exact same emotions/fears as you. I'm sad that I won't be able to spend as much time with James. My parents got E a sand/water table (which I think will be simply used as a water table or else it will just become a MUD table) for her birthday ... sincce that was the end of September we never got a chance to bust it out. I can't wait until it's warm enough here to have fun with it! You got the water table! I was just telling the hubs we may need to find one this summer as well. Kate's little suit is absolutely adorable!